I grew up in New York City and wanted to be an artist from a very early age. As a small child, I would often visit the Metropolitan Museum of Art, first with my mom and then by myself, on my way home from school. At about ten I went to work with my Dad after school in a flower shop he owned on the upper east side of Manhattan. 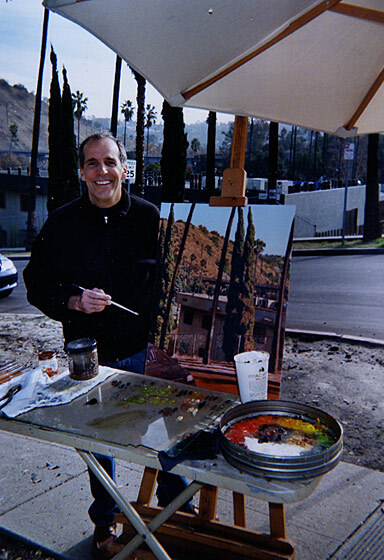 When I was fifteen, we moved from Manhattan to Malibu and a year later, I began my formal training as an artist at UCLA. Among my teachers there were Lee Mullican, William Brice, Sam Amato, Elliot Elgart and Jan Stussy. The teacher who had the most impact on me at this time however, was hyper-realist James Valerio. As I was finishing my studies at UCLA, I became interested in classical music and opera and soon began taking voice lessons with contralto Louise Caselotti. Her younger sister, Adriana Caselotti, had been the voice of Disney’s Snow White and her most famous pupil had been Maria Callas. Callas had studied with Louise in New York City from 1946-47, immediately before she made her singing debut in Italy. Aside from art, singing was one of the most magical things I ever learned and Louise was an extraordinary teacher. I studied with her for over fifteen years and by the time she died in 1999, I was singing very well. She was one of the best friends I ever had or will have and I am eternally grateful to have known and studied with her. Even though I studied voice seriously for many years, I couldn’t ever think of not painting and drawing, and I always pursued a career in fine art. In the late 1990’s and early 2000’s, I showed my work locally and nationally, and I taught painting and drawing at colleges and universities all over Southern California. In the context of a portrait commission in 2006, I received technical advice from Martha Mayer Erlebacher about indirect painting methods I had long admired, but never studied. These included glazing and the use of grisaille. I thank her so much for her generosity and graciousness in sharing her knowledge of such issues with me. From 2009 to 2015 I worked at the Judson Stained Glass Studios in Highland Park, painting on glass for churches and private residences. I worked extensively on the windows for the Church of Our Savior at the Caruso Catholic Center, USC, completed by the Judson Studios in 2012. In 2015 I returned to my own work and teaching.